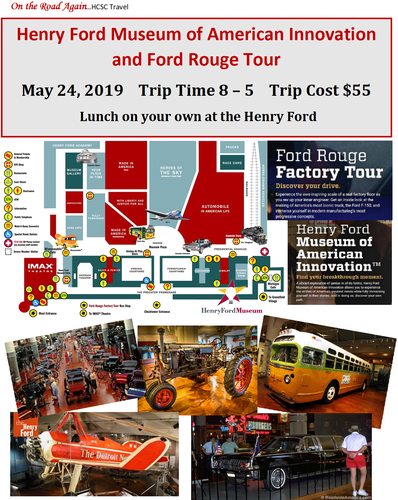 On the Road Again...HCSC Travel will be going on a bus trip to the Henry Ford Museum and the Rouge Factory in Dearborn, MI. All seniors 60+ from Henry County may participate. Please register and pay in advance at the HCSC. The bus will depart from the Henry County Senior Center parking lot. 203 Rohrs St, Napoleon, OH 43545, at 8 am. Friday, May 24, 2019. 8am-5pm. Cost is $55 with lunch on your own at the Henry Ford.